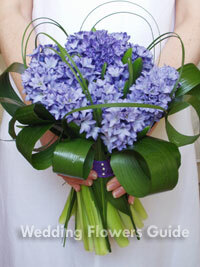 Blue wedding flowers are a popular choice for brides. 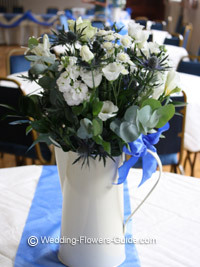 We've done several weddings where we've successfully used a combination of blue and white flowers. You could also combine blue and orange flowers. These are complementary colors so the have a natural affinity for each other. Hyacinths are a beautiful flower that also has the advantage of being fragrant. Stems of hyacinths can be arranged into a bouquet as in the example that I made in the photo below left. Alternatively, the small blue flowers can be individually removed and incorporated into a bouquet. They are also suited to being made into flower tiaras. 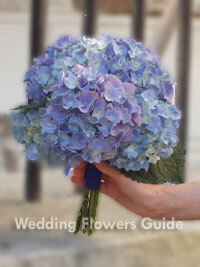 One of the largest blue wedding flowers is hydrangea (above photo on the right). This is a lovely flower for the bride wanting to make a statement with her bouquet. The individual flowers can be trimmed down to produce boutonnieres, and flowers for the flower girls. 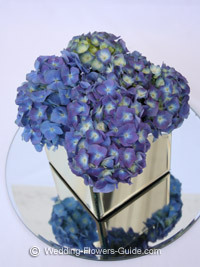 See more photos of our blue hydrangea wedding flowers. 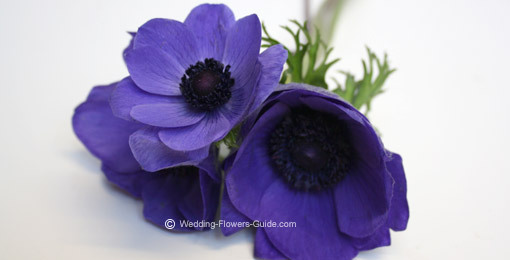 Delphiniums bring a wonderful touch of color to weddings. They are available in sky blue right through to rich dark blue varieties. Their height makes them particularly good for tall table center arrangements, and for ceremony arrangement pedestal stands. They can also be cut to make smaller arrangements and bouquets. 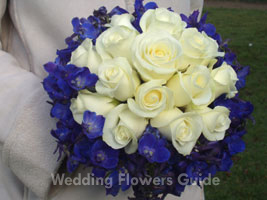 The bridal bouquet in the photo below features dark blue delphiniums in a collar around white roses. The blue, verging on violet, colored Veronica provides a lovely addition to bouquets. Its habit of curling gives a sense of movement and freedom to the arrangement, rather than it being too regimented. Statice is another flower that verges on violet. It is often used as a 'filler' flower and looks great in a simple bouquet with white roses and green foliage. Sea Holly and thistle (picured below left) are other plants that are often used as fillers. But they do have a beauty all of their own. Great results can be obtained from using thistle as a wedding boutonniere (buttonhole). This may especially suit the groom who does not like 'flowery' accessories or the patriotic groom from Scotland. 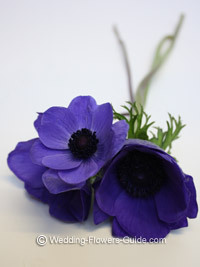 Anemones (pictured above right) have some wonderful shades of blue available. They are a delicate flower that I have used to make wedding bouquets with and they mix well with other flowers. For more inspiration, see our page on blue wedding bouquets. The wedding centerpieces can make a real difference to the look and feel of your wedding. Below are two different approaches that we have taken for brides having a blue themed wedding. On the left you can see how we have placed blue hydrangeas in a cube mirror vase and then placed it on top of a circular table mirror. This centerpiece was then finished with four tea-light candles around it. Above on the right, you can see that it is not always necessary to have all blue wedding flowers. This photo was taken just as the wedding reception room was being set up. For this wedding, we placed white flowers (lisianthus, stocks and daises) together with blue thistle and eucalyptus. The blue ribbon decorating the jug and blue table runner was sufficient color for this vintage style wedding. Let’s not forget the gents! 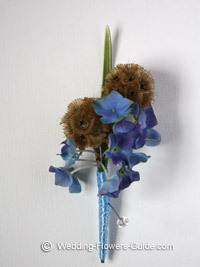 Here are a couple of different blue wedding boutonnieres that I have created. The one on the left is created from individual hyacinth flowers. The wedding boutonniere on the right is made with individual hydrangea flowers. This needs to be made on the morning of the wedding, as the hydrangea flowers do not last long after they are cut. Some of the classic wedding flowers are not available in blue. These include calla lilies, tulips, gerberas, orchids, carnations, gladioli, anthuriums and roses. You can get artificially dyed roses from specialist suppliers. These are white roses that have been grown in a blue dye. But some people think that their vibrant color just doesn't look right. You can get around this problem by the creative use of accessories such as blue ribbons and organza. You can also complement your blue wedding flowers with white varieties such as roses and calla lilies to give a more traditional feel. 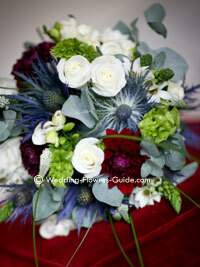 You may also like to see more photos of our blue silk wedding flowers.